A pressure washer machine is an automated instrument that generates jet forces of water to remove the dirt and grime from the surfaces or the buildings. The pressure washer manufacturers produce pressure washers in a range of sizes and different power supplies. They do so because the individual customers have it for individual purposes. As there are varieties in the types of pressure washer due to different needs, the customers ought to make sure that they buy the exact pressure washer that will suit their deliberate purposes. There are lots of marketplaces to search for these items. You will find new as well as used washers there. There is a guide here for you to inspect different types of the pressure washer and how to choose the right one for you. The pressure washer basically consists of the following three main attachments. Moreover, the device is provided with a sturdy pump and an additional hose to link to the water barrel. It is identically a cold water source. The water forces are calculated in bar units and are corresponding to which washer should be put in action according to the duty it requires. These pressure washers have a power of hundred bar unit at best. These devices are suitable for washing garden tools, furniture, motorbikes, bicycles, small private car and objects similar to these. With a light duty pressure washer, you can clean small to medium decks and patios. It is available at a low price. But there are some light duty models at a higher price as they come with some additional features. These pressure washers have a power of 110 bar units and more. 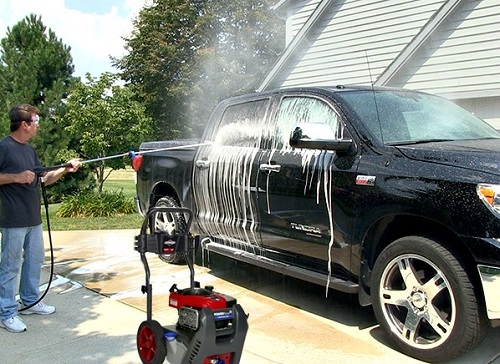 A medium duty pressure washer is ideal for cleaning cars and other transports. Also, you can have this to clean gutters, drains, and grates. With such power washers, you can clean pools, hot tubes, and fences. A medium duty pressure washer is ideal a medium to large patios and decking areas. They are medium in a price range. You can achieve it at around $300. A heavy duty pressure washer achieves a pressure spray range of up to 130 bars. The range of power bar unit depends on the power of the pump. They are perfect for washing heavy transports and brick and stone made surfaces. As the pressure of the water stream is a very extreme range, this is a strong recommendation for the users to take caution while using and handling the machines. These types of pressure washer are ideal ones for industrial purposes only. They are available on the market a price range from $700 to $3000. 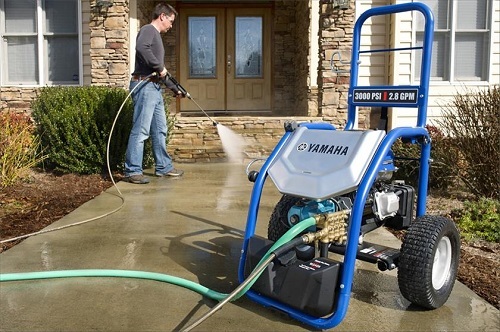 There are different types of pressure washers depending on their power supply sources. When you are looking for a pressure washer, it is obviously a good idea to choose the right one considering where you will employ your machine and what objects you need to be cleaned. 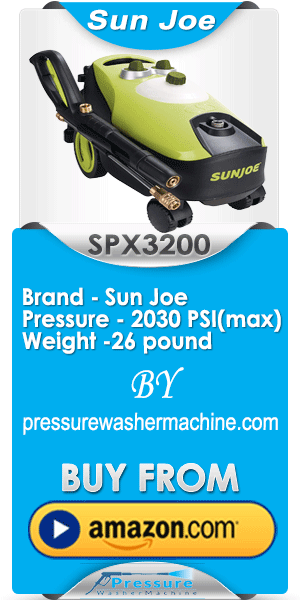 It has a great influence on choosing the right pressure washer. This is an electric pressure washer. It is important to notice that if the pressure washer comes with an electric motor. If yes, the machine needs to be connected to electric power output or a generator to work. Basically, light and heavy duty pressure washer often arrive with an electric pressure washer. They are ideal to operate in and around the home. As you can guess from its name, this type of pressure washer depends on petrol as a fuel to power the pump. Petrol run pressure washer is available in many sizes. It is perfect for medium and heavy-duty projects. As it uses petrol as a fuel, it generates fumes in operation. So, a petrol engine pressure washer is ideal for outdoor use only. They are typically no more different from the petrol engine pressure washers. They use diesel instead as its fuel. Like petrol engine washer, they are perfect for medium and heavy duty works. It also generates fumes as usual. So, it is a further recommendation to avoid using this machine for indoor uses. The hydraulic pressure washers are the best to use in farms and agricultural industries. They are engineered with an existing hydraulic mechanism to generate energy just like a tractor. There are a lot of benefits to using a hydraulic pressure washer. It reduces the want for fuel to produce power. You can use this machine very far area away from electric power output. The hydraulic pressure washers are quiet in nature, compact in design, and very light in weight. This is not suitable to use at home or in a garden. Rather, it is great for commercial use only. Identify where you will keep your pressure washer and why you use this. If it is indoor use and for small items like small patios, garden tools, etc. choose a light duty electric pressure washer. Also for indoor use, never select a diesel or petrol engine pressure washer as they will produce lots of fumes. Make sure where your power will come from to run the pump and how much strength it needs. It is important to identify the area where the washer will occupy. For a large outdoor area where there is no electric supply available, choose a hydraulic pressure washer. It is better than a diesel engine machine. Be prudent. If you need to connect the pressure washer to a water source, never forget to attach a filter to protect sediment and dirt from going into the pump. If you do not do choose a model with a filter, it can damage the device as it will use dirty water.